We have an update to the briefing given to the Legislative Education Study Committee and others here. Please note that there have been changes to the graduation data (page 8) and an addendum added (page 34) addressing the percentage of teachers evaluated at or above proficient. 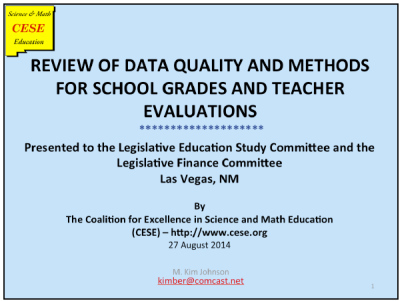 CESE has received many requests for copies of the presentation on "Data Quality and Methods for School Grades and Teacher Evaluations" that was given to the LESC/LFC committees and other groups of professionals concerned with public education. We are pleased to announce that the latest version of the presentation is available here for download and perusal. The document is just under 5 Megabytes in size; it is a PDF version of CESE's Powerpoint presentation, augmented with notes as necessary. Questions about the presentation should be directed to CESE past president/ current board member Kim Johnson, who has spent months developing this briefing. Kudos, Kim! CESE board member Kim Johnson has been hard at work refining our presentation on the CESE Method for determining how New Mexico's schools, students and teachers are faring. 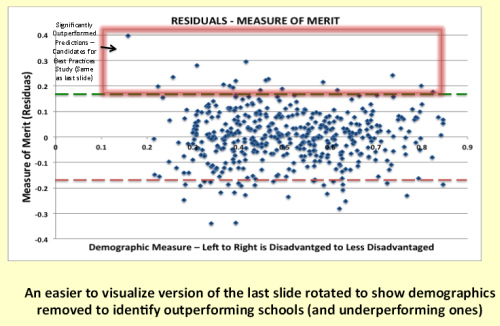 While the method was originally developed to provide clear paths to school improvement, it can also be used to make teacher merit evaluations much, much fairer than the proposed PED A-F method of assigning scores for performance. You can peruse the updated presentation here. Questions about the CESE Method should be directed to board member Kim Johnson. 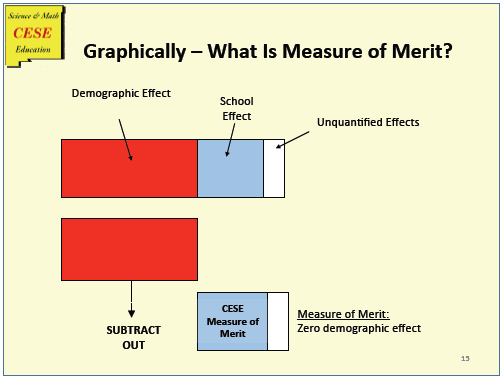 The CESE Method is a method for showing schools how to improve, as opposed to the current New Mexico Public Education Department system, that only shows schools how well they are doing compared to standards. The method is described briefly in this two-page PDF document, and in more detail in this 20-slide briefing (PDF). How do CESE Results compare to PED Grades? 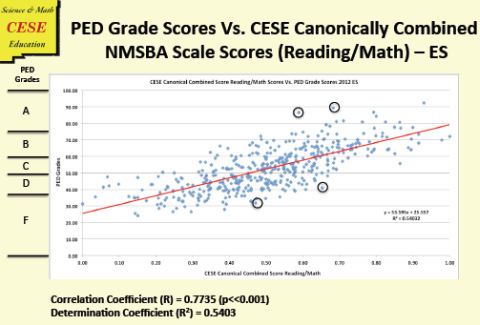 One of the questions that is most asked of CESE when we present the CESE method is how the CESE Method results compare to the New Mexico Public Education Department (PED) grades. Here is a two-page introduction that summarizes and provides context for a 29-page briefing which provides detailed comparisons for 2012 New Mexico school grades.